The North Queensland Strata Title Inspection Program is a three year project that is the development and carrying out of an inspection and assessment program for Body Corporate properties in North Queensland. The $12.5 million, three-year program is funded by the Federal Government, administered by the Queensland Government, and independently developed and deployed by James Cook University. It will improve the information available to those Body Corporates about a properties susceptibility to weather damage and ways to make properties more resilient. The Program is a long-term project that is to deliver an ongoing legacy of more resilient Strata Title properties, which will reduce cyclone impacts, and recovery time of communities. 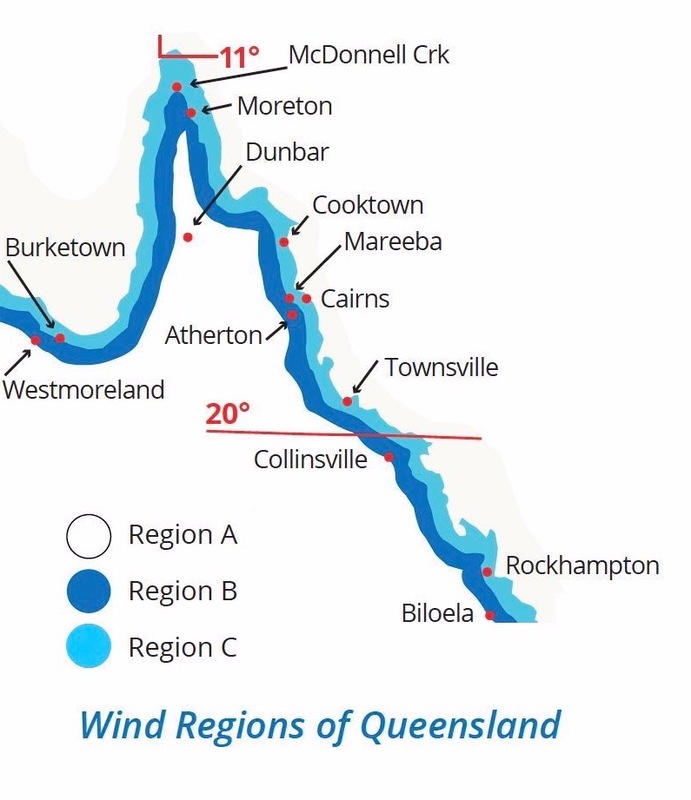 The location of the program includes those coastal areas within the combined regions B & C as indicated on the Australian Wind loading Map shown on the left. It also incorporates areas north of the southernmost boundary of the Rockhampton Regional council area extending to the Qld/NT border and extending 100kms in from the coast incorporating islands of the coast. The Inspection and Assessment Program will be available from the 1st April 2019. You can register using the button below from that date. Contact us at the email below for more information.